Editor’s Note: This isn’t exactly in the spirit of Christmas, but what the hey. How could I not be jealous? Sure, they haven’t won a World Series since 1908. But as a #Phillies fan, watching his favorite team slowly dip their toe in the swampy waters of Rebuilding River, it’s pretty easy to look at what the #Cubs have done and find myself becoming a Wrigley Wannabe. Theo Epstein and Jed Hoyer leave the Red Sox (in 2011) to head up the Cubs front office, bringing their combined baseball genius. Joe Maddon leaves Tampa Bay (in November 2014) to manage the Cubs. Pretty much one of the best and most respected managers in the game heads to Chi-town, and why not? With a pretty tiny budget and not much of a fan base, the pride of Hazelton, Pa., managed six straight years of over .500 ball in the AL East — competing with big-spenders like the Yankees and Red Sox. The Friendly Confines are getting a new scoreboard with cool video functionality. So they’ve got 1B and SS covered with young talent in Anthony Rizzo and Starlin Castro. They have lefty pitcher Travis Wood (a 2013 All-Star) and righty Kyle Hendricks (who impressed in 13 starts last year). And Hector Rondon was a solid closer. And of course, the gems of the farm system. In addition to added-via-trade SS Addison Russell, there’s the great draft picks: OF Jorge Soler (power), IF Javier Baez (bat speed compared to Gary Sheffield), 3B Kris Bryant (POWER) and C/1B/OF Kyle Schwarber (moved up twice in his first year as a pro). —Traded two minor leaguers for C Miguel Montero. For the price of two not-top-prospects, they got a veteran leader behind the plate who’s solid on offense and defense. And a lefty-batting catcher, to boot. —Signed LHP Jon Lester (6 yrs, $155MM). Kinda surprising, but not really. The Red Sox didn’t make enough of an effort, Oakland doesn’t usually do the big signings (not very Moneyball), and I didn’t hear much of anything about the Yankees or other big spenders. OH, and ol’ Jon knows the front office guys pretty well from Boston. Which means he knows that there is winning in the future. (And $155 million is a nice incentive, too.) Here’s your #1 starter, Cubs fans. —Signed RHP Jason Motte (1 yr, $4.5MM). And why not take a chance for that amount? This guy was a dominant reliever for the Cardinals, led the league in saves before Tommy John surgery, and has postseason experience. He’ll probably be a setup guy and serve as insurance for Rondon. —Signed C David Ross (2 yrs, $5MM). Veteran catcher with a solid bat and hey wait, another Red Sox-connected guy who just happened to catch a whole lot of Jon Lester’s starts! Makes complete sense, and now they have a nice pair of experienced catchers who can hit, too. So it started at the top. New leadership with experience in building a winning franchise. They started with the draft and the minors. When the time was right, they went and got a smart, creative and fan-friendly manager who led his teams to winning seasons despite big obstacles. And now, the great young talent is starting to present itself. Some is already at the major league level, some will be arriving in 2015 and 2016. Then they added a bunch of veteran leaders, a clear #1 starter and a deep pool of rotation candidates. Boom. Contender. And if they’re smart enough (which they are), a possible dynasty. 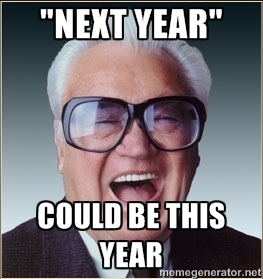 The window for the Cubs is open. Rejoice, Northsiders. Pretty soon, you’re likely to be “Loveable Losers” no more.